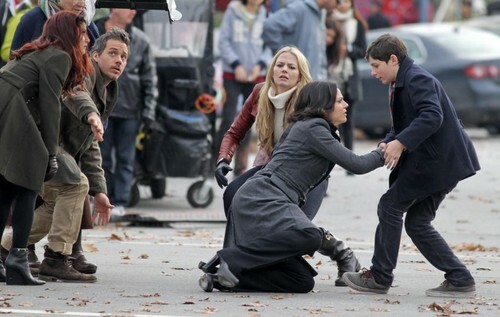 Swan-Mills Family. Season 3 BTS. HD Wallpaper and background images in the Regina and Emma club tagged: once upon a time jennifer morrison emma swan lana parrilla regina mills henry jared gilmore on the set behind the scenes season 3. This Regina and Emma photo contains pak, straat, stad scène, stedelijke omgeving, stad straatbeeld, and stedelijke instellen. There might also be hip boot and thigh boot.